“The special delights of the hot spring are for the unaccompanied gentleman,” states the introduction to Yasunari Kawabata’s “Snow Country,” instantly seizing the attention. 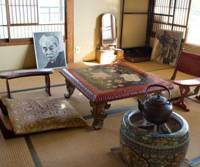 The resort of Kawabata’s imagining is at once a place of timeless beauty and a token of the march of modernity. The stars of the night sky press so close as to “fall with the swiftness of the void” just above mountains that are “brilliant with the color of snow,” even in darkness. 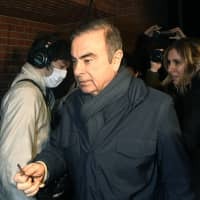 Pages later, guests in the resort enjoy the Western pursuits of skiing and hiking before relaxing in the bath, and the protagonist flees his geisha lover by the new train line through the mountains, returning to Tokyo. To see what remained of Kawabata’s “Snow Country,” I visited at the beginning of this year’s ski season, just after the first large snowfalls. Heading to Yuzawa on a shinkansen crowded with skiers is but a taste of things to come: Yuzawa is now far more ski resort than hot-springs town. The bubble-economy ski craze that transformed mountains all over Japan made its mark here too, with 20 areas ranging from small beginners’ hills such as the oldest, Nunoba, which was in use during Kawabata’s visit, to ski megaplexes spanning several peaks. 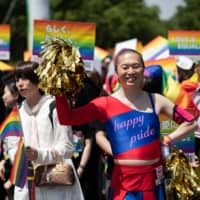 “Yuzawa’s very strong point is that it’s convenient,” said Andrew Lea, an 18-year resident of the area and owner of Snowjapan.com, a site that introduces foreigners to skiing in Japan and tracks snow conditions across the country. “From Tokyo you can be in Yuzawa in an hour and a quarter,” explained Lea. And despite the proximity to lowland Tokyo, Yuzawa’s conditions are not to be underestimated. “We have one of the heaviest snowfalls in the world,” said Lea. 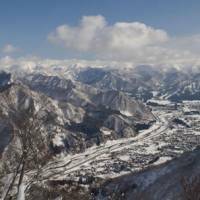 GALA Yuzawa Ski Resort is perhaps the most convenient, as the large resort runs a gondola directly between its own shinkansen station and the runs above Yuzawa, but those who can spend more than a day in town will enjoy the resorts at higher elevation, a short shuttle bus ride away. When you’ve had enough of the slopes, hot springs are available all across Yuzawa to soothe aching muscles, although the finest bath likely belongs to the Snow Country Inn Takahan, the same 800-year-old establishment where Kawabata stayed to research his novel. The bath, called Tamago no Yu (egg-water) due to its slight sulfur content, is what draws most of the inn’s 20,000 yearly visitors. “Unlike other places that recirculate and sterilize the bath water, ours is drawn as is, straight from the source, and isn’t recirculated,” explained Harumi Takahashi, proprietress of the inn. 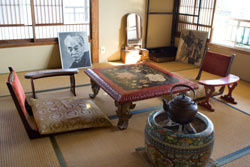 Like several other inns and hotels throughout Yuzawa, Takahan’s bath is available to both guests and the public between 1 p.m. and 6 p.m. After the bath, be sure to check out Kawabata’s room, complete with early Showa Period (1926-89) furnishings, which was preserved in honor of his 1934 visit when the inn was rebuilt in 1989. 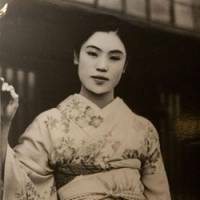 Also very interesting is the photo of the beautiful Matsuei, the geisha Kawabata met in 1934 and who became the model for Komako, his tragic heroine. 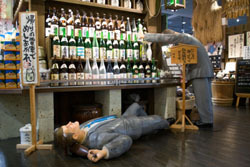 A visit to Snow Country would also not be complete without sampling Niigata’s famous sake, the same that caused Kawabata’s geisha to flush red beneath her snowy makeup and fall into the arms of the wealthy dilettante, Shimamura — reputation be damned. Located within Echigo-Yuzawa Station, Ponshukan is a rice and sake shop specializing in Niigata’s Koshihikari breed of rice, and is a great place to sample local delicacies. A small restaurant serves massive rice-ball lunch-sets from ¥400, but far more interesting is the sake-tasting corner, where a wall lined with 99 sample dispensers represents every brewery in Niigata Prefecture. 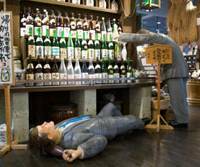 The difference, he said, lies in the fresh snowmelt used in the fields and the spring water used for Niigata sake. “If the water is good, the rice is good,” explained Kuwabara. Ponshukan goes so far in its celebration of sake as to include a hot spring next to the sake corner where booze is mixed into the bath water — not nearly as delicious as it sounds, trust me. As the train cuts through Yuzawa faster now, hot springs and hotels have multiplied, and ski runs sprawl across the mountains. 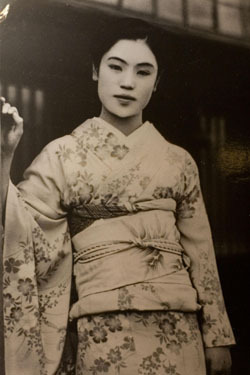 Where, though, is the harsh beauty of Kawabata’s Snow Country; the geisha whose white faces mirror the snow; the beauties who, eking out an existence entertaining weekend guests, tread the perilous line between artist and prostitute that their esteemed city colleagues did not have to face? Where has the Snow Country survived roadside sprinkler systems, global warming’s shorter and shorter winters, the snowplow, the snowblower? As I sank into my fifth hot-spring bath of the weekend, still warm from my samples of sake, all alone on the rooftop outdoor bath of the Hotel Sporia Yuzawa, I really wasn’t sure. The sun had set and the concrete of the town was falling into darkness, while the white of the peaks was edged in the pale blue of the fading light. In the crystalline stillness of a pure sky on the edge of day, I had to admit that Kawabata’s Snow Country had been there all along. 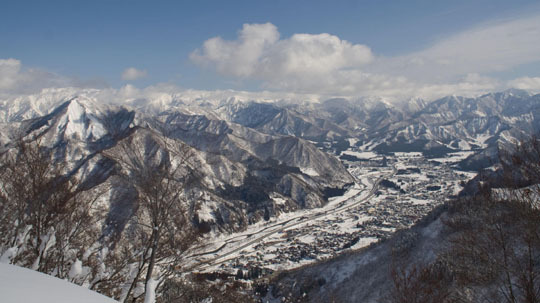 Yuzawa is accessible via shinkansen from Tokyo (¥6,900, 77 minutes to Echigo-Yuzawa Station) or the Kanetsu Expressway. Night buses from Kansai cost about ¥5,000 and let skiers get an earlier start than on the train. Gala Yuzawa (www.galaresort.jp/winter/english/) offers full day, morning and afternoon ski passes (¥4,300/¥3,200/¥3,500). Be aware that most of Gala’s expert runs are closed this season due to a geological survey. 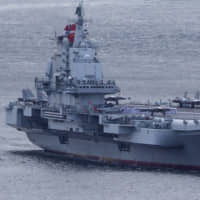 Snowjapan.com provides impartial information on conditions and accommodation throughout Japan, as well as reader reviews of each resort. 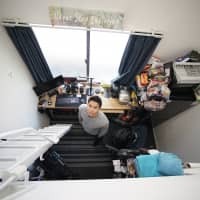 Yukiguni no Yado Takahan (www.takahan.co.jp) has rooms from ¥12,600; visiting the bath costs ¥1,000 for nonguests. Ponshukan’s (www.ponshukan.com) sakeburo (rice-wine bath, ¥800) is open between 10:30 a.m. and 7:30 p.m., while the main shop is open from 9 a.m. to 8 p.m. The Yuzawa Town History Museum (Yukiguni-kan, ¥500, 9 a.m.-4:30 p.m., closed Wednesday) is a seven-minute walk east of Echigo-Yuzawa Station. Hotel Sporia Yuzawa’s bath costs ¥1,000 and has fine views.